One of the great things about genealogy and these National holidays is that I can put my family in the context of the times. Therefore, this weekend as we celebrate the birth of our nation 240 years ago, I can marvel in the fact that I know that my ancestor Benjamin Sublett was a patriot fighting England for our Independence. 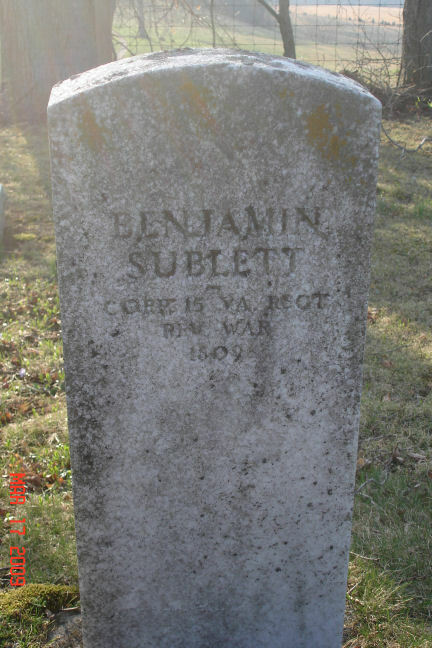 Benjamin was born to Pierre Louis Soblet and his wife Marte Martain on 23 April 1733 in Goochland, Virginia. Benjamin is my fifth great-grandfather. Benjamin was the sixth child born in this union. His parents were Huguenots. They fled France to Virginia in 1700. Benjamin grew up with five brothers and a sister. Both his parents were deceased prior to the Revolution. Benjamin married Elizabeth Molly Jordan when he was 29 years old (24 June 1762). Together they had nine children. Benjamin was part of a variety of Regiments during the Revolutionary war, including the 5th and 11th Regiment. According to a Sons of the American Revolution Membership application, Benjamin was first a Private and then a corporal in Captain James Grey’s Company of Foot; he was a Corporal of Major Stephenson’s Company. He enlisted on 6 December 1776 and was discharged on 9 December 1779. Benjamin has the distinction of having served under General George Washington at Valley Forge (source: Valley Forge Muster Roll). He was discharged as a Sergeant (Cameron, 2008). On 20 June 1783, Benjamin received a land grant (200 acres of land) as payment for his service to his country. It was this land grant that moved the family to Kentucky (Kentucky Secretary of State, 2016). Benjamin was fifty years old. It is somewhat unclear exactly when the family moved to Kentucky. It appears to be between 1788 and 1800. As his youngest daughter Mary Scott Sublett was born in Charlotte, Virginia on 12 February 1788 and his wife died in Kentucky in 1800. I will have to look at deed records to get a more precise time. Benjamin died around 1815-1816* and is buried in Highland Cemetery, Bowling Green, Warren County, Kentucky. He was 82 years old. *There seems to be some confusion on his date of death. The marker indicates 1809; however, there seems to be information that there was a will dated 19 May 1815 where he bequeathed his property to his son Benjamin Branch Sublett. His will was probated February 1816 (Source: Allen, 2008). Allen, Cameron, The Sublett (Soblet) Family of Manakintown, King William Parish Virginia, 45th Anniversary Edition, 2008. Until later, I will be exploring backwards! Happy 4th of July!